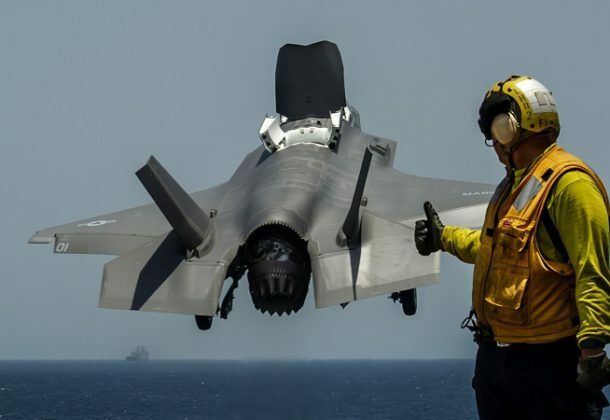 Despite being ridiculed as the most expensive defense program in US history, the F-35 fighter jet is expected to add $2 billion to Maryland’s economy over the next decade, and almost 6,000 civilian and military jobs to the region, reports WAMU 88.5 radio. The number of F-35s at Luke Air Force Base has grown –it’s now at 85 — and that means more noise around the Arizona base near Phoenix, reports Air Force Times. January saw the base record a dramatic increase in noise complaints from people living around the installation. Singapore’s next fighter jet just might be the F-35, reports National Interest, and apparently that won’t sit well with the Chinese. Possession of the jet would enhance Singapore’s power. Acting DefSec Patrick Shanahan made a surprise visit to Afghanistan last week, his first since becoming acting defense secretary. He met with US and Afghan leaders to discuss the peace talks and assess the risks tied to a potential drawdown, reports Military Times. He said he has no orders to reduce the US’s presence there, reports The Washington Times. A former US Pacific Fleet spokesman who wrote emails and provided talking points for “Fat Leonard” Glenn Francis was sentenced to six months in prison Friday, reports Navy Times. Now-retired Navy Capt. Jeffrey Breslau also must pay a $20,000 fine and perform 250 hours of community service as part of the sentence. A Government Accountability Office report says that despite progress in closing a shortfall in its maintenance ranks, the Air Force is still coming up short on its most experienced maintainers, reports Air Force Times. More troubling, according to the GAO report, is that the service does not have a strategy to improve retention of those airmen. Lawmakers are meeting in a late-stage attempt to avert a government shutdown, The Washington Post reports, trying to revive talks that derailed over the weekend amid a dispute on immigration enforcement rules. The Pentagon is shifting 250 troops from Arizona to reinforce the port of entry at Eagle Pass, Texas, in response to a new caravan headed toward that US-Mexico border, reports Military Times. Aman, a five-day multinational exercise hosted by Pakistan’s navy has kicked off as part of efforts to enhance cooperation combating pirates, terrorists, and smugglers, reports The Associated Press. Among the participants are the US, Japan, Great Britain, and more than 40 representatives of other nations. Military housing conditions are under congressional scrutiny amid reports of failures by private contractors to maintain acceptable living standards at a host of sites around the country, reports Military Times. The Navy is changing its waiver policy after the death of Chief Petty Officer Shannon Kent, the Fort Meade officer who died in an attack in Syria last month, reports Capital Gazette. CPO Kent was in the process of appealing the waiver denial that led to her deployment before she became the first female sailor killed in the fight against ISIS. Capt. Patrick Lynch of the Association of Maryland Pilots, who for more than four decades guided ships up and down the Chesapeake Bay, died last week, The Baltimore Sun reports. He was 89. He began his career in the late 1950s as a bay pilot on what is the longest single pilotage in the world, extending 150 miles from Baltimore to Cape Henry, VA.
Lockheed Martin Corp., Rotary and Mission Systems, Moorestown, New Jersey, is awarded a $211,996,197 cost-plus-incentive-fee, cost-plus-fixed-fee modification to previously awarded contract N00024-18-C-5105 for incorporation of remaining Baseline J7 scope for new-construction DDG Aegis Weapon System J7 Baseline development and integration in support of the Japan Maritime Self-Defense Force (JMSDF). This modification will provide for continued JMSDF Aegis Combat System J7 Baseline development and integration. These efforts include full operational capability at the development test sites, execution of J7 Baseline development and integration activities, integration of Japanese domestic ship systems, in-country integrated test team support and provision of technical manuals, logistics and staging activities. Work will be performed in Moorestown, New Jersey (73 percent); Yokohama, Japan (11 percent); Mount Laurel, New Jersey (6 percent); Kawasaki, Japan (3 percent); Nasu, Japan (3 percent); Nagoya, Japan (2 percent); Tokyo, Japan (1 percent); and Washington, District of Columbia (1 percent), and is expected to be completed by October 2021. Foreign Military Sales funding in the amount of $211,996,197 will be obligated at time of award and will not expire at the end of the current fiscal year. The Naval Sea Systems Command, Washington, District of Columbia, is the contracting activity. McKinsey & Co. Inc., Washington, District of Columbia, is awarded $15,730,560 for modification P00002 to a firm-fixed-price, cost-plus-fixed-price delivery order N6833518F0362 previously issued against blanket purchase agreement (N68335-18-A-0042) in support of the F-35 Lightning II affordability campaign for the Navy, Marine Corps, and Air Force. The modification provides for maturation of the current effort through expansion and refinement of existing scope, including strategic sourcing, senior leadership team offsite, and major contract actions. Work will be performed in Arlington, Virginia, and is expected to be completed in June 2019. Fiscal 2018 aircraft procurement (Navy); and fiscal 2019 aircraft procurement (Marine Corps and Air Force) funds in the amount of $15,730,560 will be obligated at time of award, none of which will expire at the end of the fiscal year. This modification combines purchases for the Navy ($6,001,250; 38 percent); Marine Corps ($6,001,250; 38 percent), and Air Force ($3,728,060; 24 percent). The Naval Air Systems Command, Patuxent River, Maryland, is the contracting activity. CACI Inc. Federal, Chantilly, Virginia, has been awarded a not-to-exceed $11,530,702 modification (P00010) to previously awarded contract HQ0423-15-F-5001 for comptroller mission systems support for the Office of the Under Secretary of Defense (Comptroller). This modification exercises Option Year 4 with a period of performance of Feb. 16, 2019, through Feb. 15, 2020. The modification brings the total cumulative face value of the contract to $51,604,376 from $40,073,674. Work will be performed at the Pentagon and in remote locations within the National Capital Region with an expected completion date of Feb. 15, 2020. Fiscal 2019 operations and maintenance Defense-wide funds in the amount of $11,530,702 are being obligated at time of award. The Defense Finance and Accounting Service, Columbus, Ohio, is the contracting activity.